Merry Christmas and wishing you all a healthy and joyous 2019. As Thaddeus and I spend time with family, I’ll try and keep you updated on the knitting and other activities that are keeping me busy. For Christmas Eve, I review a new gem of a book. Do you call if ombre? Is it fade? Or do you use the term from the book I’m reviewing today…gradient? 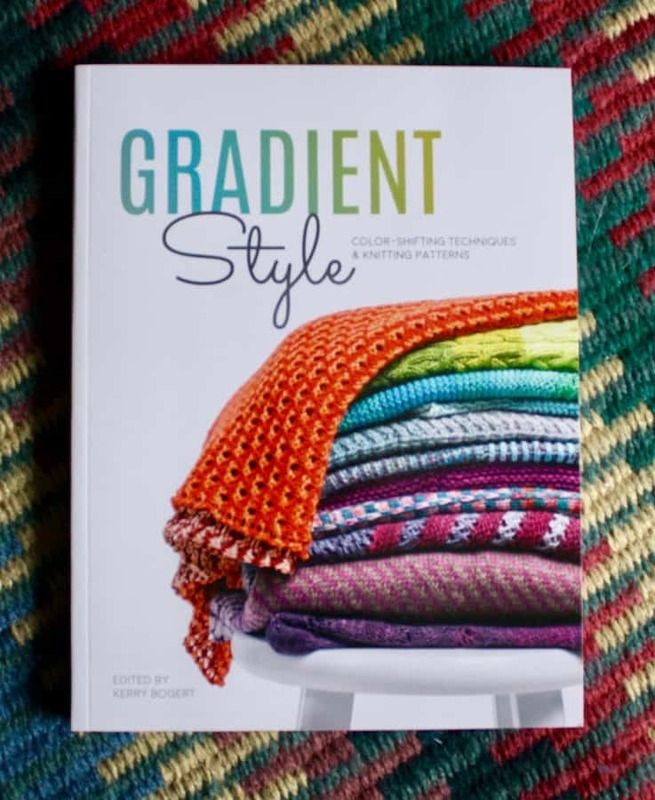 Gradient Style edited by Kerry Bogert is a compilation of information, techniques and patterns using yarns that gradually shift between different colors throughout the length of the yarn. And that includes both gradual color changes and darkness/lightness change using the same color. From a techniques and background information perspective, the book is excellent. Emma Welford takes you through commercially dyed gradient yarns to creating your own. She also does a very good, succinct job of color design theory which I found useful. I particularly like that she included the use of mottled/spotted dyed yarns in blending with other colorways. The Projects section of the book is filled with designers that are mostly new to me. Typically when I review a book, I go through and pick out my three favorite designs. After I did that, I went back to find out two of the projects were from the two more well-known designers (to me). Honestly, I had no idea my friend Kyle had designed a project for the book, but I picked it immediately as my favorite. I didn’t realize it was his design until I went to document the photo with a caption. 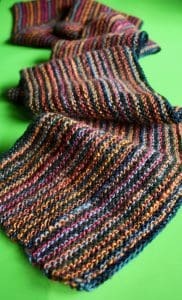 I’m a huge fan of the vibrant color choices he used in this stranded knitting hat. This is definitely a project I’ll be making. Finally, my third choice is an unusual choice for me, but I really love it. 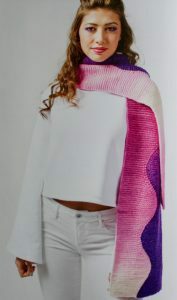 Natalie has used a very basic, simple idea for the Shape Shifter Scarf. It’s one of those ideas I am envious that I didn’t come up with myself. Not my typical favorite, I even like the color choices for this garment. There are a total of 19 projects in this book. The retail price is US$26.99, but readily available for under $20. It’s an Interweave publication, so the quality is good. I would definitely recommend including this book in your knitting library. I’m always curious if folks take my recommendations! 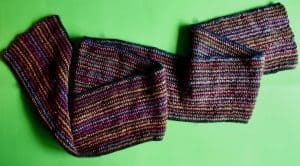 Finally, the Garter Scarf is finished. I’m quite pleased with how it turned out…soft, warm and VERY long. It turned out to be 7 inches wide and 84 inches long. While I decided what to knit next, I did a bit more work on Dolores’ red and white striped scarf.